The present portrait of Frances, Countess of Dartmouth was acquired for the Thyssen-Bornemisza collection in 1977 from the UK art market. As with a number of other paintings from the Collection, in particular 17th- and 18th-century Italian works, it was displayed in Daylesford House, the residence of the Baron and Baroness in England. The information provided at the time of its purchase includes the date of the painting and its earlier history. In the 19th century Reynolds’ portrait was owned by the Earl of Feversham and was loaned by the Earl to an exhibition held in Manchester entitled Art Treasures of the United Kingdom in 1857. In 1927 it was with Leggatt Brothers. The painting is mentioned in the monographs on Reynolds by Walter Armstrong, published in 1900, and Waterhouse of 1941. 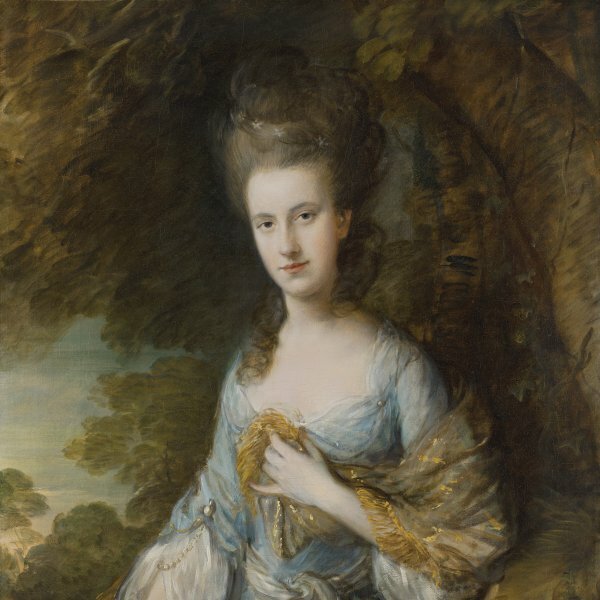 Frances Legge, Countess of Dartmouth (1733–1805) was the daughter of Sir Charles Gunter-Nicoll and Elizabeth Blundell. 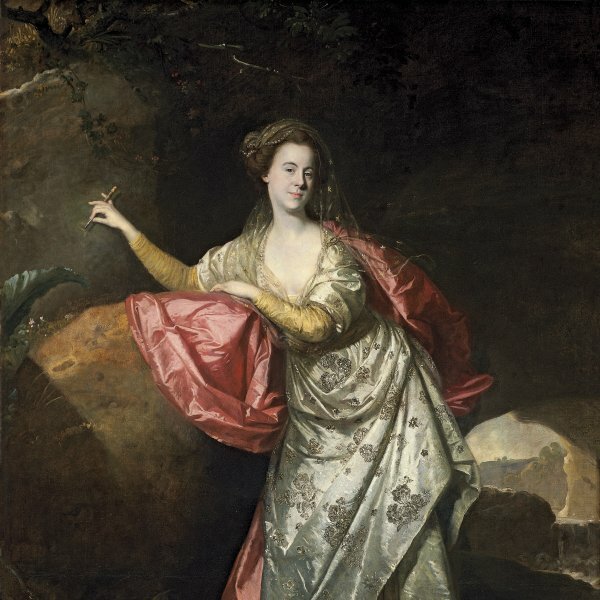 In 1755, one year before the date of this canvas, she married the 2nd Earl of Dartmouth. The young Countess is described by a contemporary as being an attractive woman who had been well educated and had a good sense of humour. Reynolds executed this female portrait a few years after his return from Italy and after he had permanently settled in London in 1753. During that decade he began to establish himself in the capital’s art world and to acquire a distinguished group of clients whom he depicted using the knowledge he had acquired during his study trip to Italy. Reynolds worked in the grand style in his portraits, drawing on both antiquity and the Renaissance, which he fused with elements traditional to the genre of portraiture. 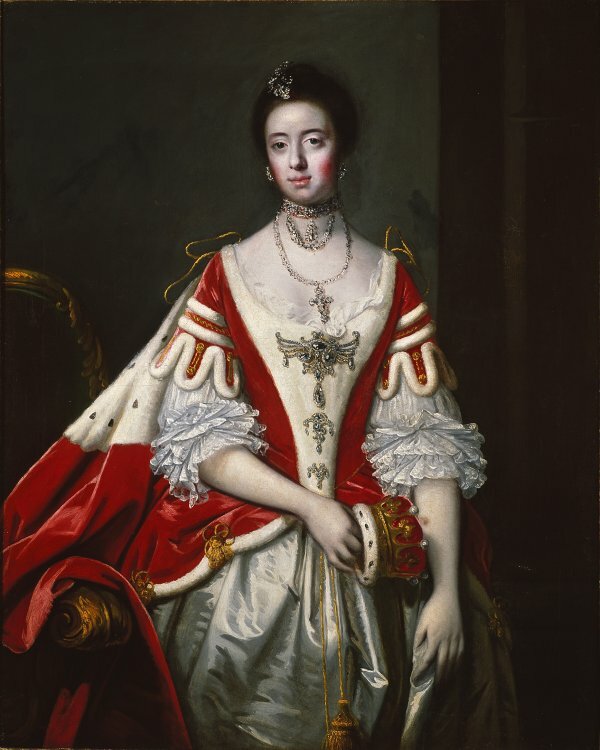 The Countess of Dartmouth wears formal court dress with a low-necked, fur-trimmed, white satin dress decorated with a wealth of diamond jewellery in the form of stomachers and long and short necklaces. In her right hand she holds her coronet of rank. Reynolds uses a plain, dark background in which we can make out the back and arm of a large chair on the left and part of an architectural element on the right. The Countess’ delicate, very pale skin is comparable in tone to the trimming of her dress and her lace sleeves, which are almost the same colour. Her body and face, with its bright patches of rouge on the cheeks, are presented frontally and the Countess looks directly at the viewer with a slightly absent gaze. The name of the sitter is recorded in Reynolds’ Pocket Book in which the artist noted several sittings with the Countess, some of them cancelled, as well as a drawn copy of the portrait.